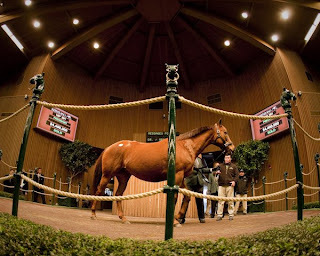 Horse of the Year and three-time champion Azeri went through the ring as scheduled Monday at Keeneland's January all-ages sale, but the final $4.4 million bid was not enough to convince seller Michael Paulson to part with her, even on a day that saw 40- to 50-percent declines across the board. Azeri was in foal to 2004 Horse of the Year Ghostzapper, and fetal sexing shows that she is carrying a filly, according to Paulson. Paulson consigned Azeri through John Sikura's Hill 'n' Dale sales agency.